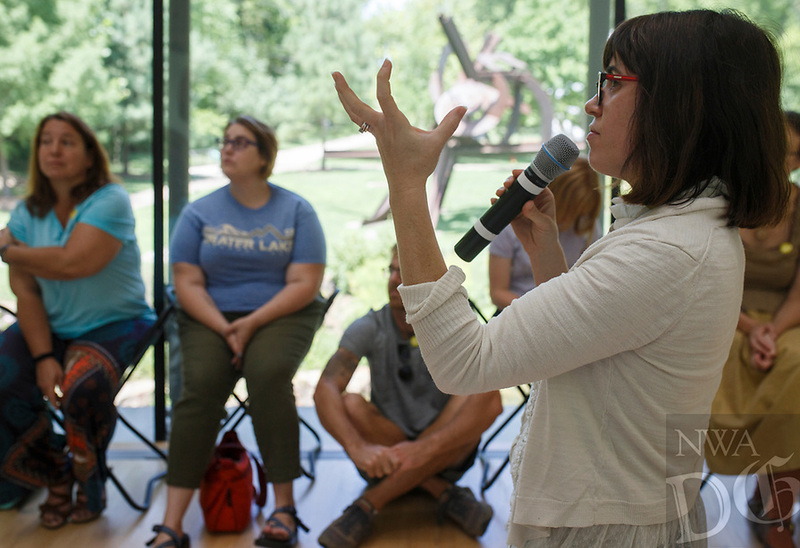 NWA Democrat-Gazette/CHARLIE KAIJO Museum educator Amanda Driver (right) prompts attendees to reflect on a sculpture as part of a meditative exercise during an art meditation event, Monday, August 6, 2018 at Crystal Bridges in Bentonville. The session called "Meditation and Mindfulness" gives visitors a break from their day to visit Crystal Bridges for rejuvenation in a guided meditation and mindfulness program. The session is held indoors in front of artworks from permanent collection galleries or outdoors along the trails and grounds. The sessions typically fall on the first Monday of the month. Next month it will fall on the second Monday in observance of Labor Day.